Love this beer. First discovered it on a visit to Auckland earlier this year. Great taste, grapefruit like flavours and nice hoppy flavours shine through. So glad it can be bought at sanza. Try it. First tried three wolves on a recent visit to Newlynn Auckland. Great beer pours leaving a nice light head. Flavour is well rounded with grapefruit tones, not to gassy . Fantastic partner for your favourite curry. 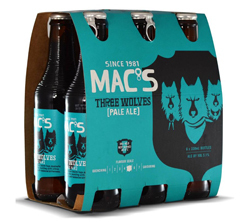 Macs also produce a range of other drinks that can be purchased on Sanza .